Before you begin your walk we encourage you to carry water, wear a hat, sunglasses, and sunscreen. Stay on the trails. Take only photographs, leave only footprints. 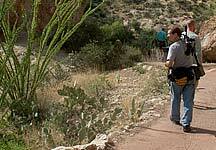 For more hiking in Arizona, click HERE, or for more trail details, click HERE. Main Trail: The main trail is 1.5 miles and begins at the Visitor Center. Please allow yourself at least two hours for the full tour. While walking the main trail, you will encounter numerous trails that shoot off from the main trail. We encourage you to explore and enjoy. However, be advised that is difficult to see the entire Arboretum in one day. Signs are posted on trails that are not recommended for wheelchairs. High Trail: For those looking for a more rugged experience, this 0.45-mile trail will take you through the Upper Sonoran Natural Area. Sonoran Desert: Follow our 0.3-mile long Curandero Trail to learn more about the medicinal and edible plants of our native flora. Chihuahuan Desert: The 0.27-mile trail through this exhibit showcases plants from the Chihuahuan Desert of North America located in Chihuahua, Mexico, west Texas and southern New Mexico. South American Desert: This 0.2-mile trail showcases plants from Cuyo, Monte and Chaco regions of Argentina, Paraguay and Bolivia.